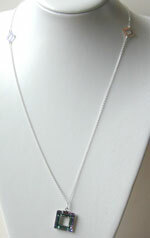 This necklace is very feminine.The focal point at the end of the 32" sterling silver chain necklace is a 2cmx2cm swarovski square called crystal vitrail.The stone changes colour, mixing from baby blue to pretty pinks. To echo the square geometric theme I have added sterling silver diamond connectors halfway down the necklace(necklace shortened for display purposes). This swarovski necklace would be a perfect accessory for summer dresses and the 60's look which are back in fashion.